1.) Q. What are the procedures for getting married in the Catholic Church? A. 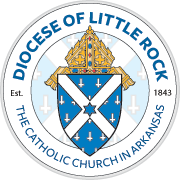 In the Diocese of Little Rock couples begin the process by meeting with their pastor at least six months before the anticipated wedding date. Our diocesan policy on marriage mandates a minimum of six months for the preparation process. Besides meeting with your pastor, you will be asked to complete the Facilitating Open Couple Communication Understanding and Study (FOCCUS) pre-marital questionnaire, participate in an educational class or program, such as Pre-Cana or Sponsor Couple and participate in a full course of Natural Family Planning. The Church recognizes the struggle of living a Christian marriage in a secular world, and wants to give you ample time and tools to reflect on the important issues of marriage and the pitfalls some married couples experience. To learn more, see Marriage Education Programs. 2.) Q. What does the sacrament of marriage mean? A. Marriage is a covenant by which a man and woman form with each other an intimate communion of life and love (Catechism of the Catholic Church). In marriage a man and a woman mutually consent to give themselves to each other totally and exclusively in a union that is unifying, indissoluble and open to life. If the man and woman are both baptized, the union is a sacrament. To learn more, go to About Catholic Marriage. 3.) Q. What’s wrong with cohabitation prior to marriage? A. First, cohabitation means living together in a sexual relationship when not married. The Church teaches that the sexual act is reserved exclusively to the marriage covenant. Living together outside of marriage jeopardizes the sanctity of marriage and is contrary to Church teaching. Substantial studies have shown that couples who cohabitate, whether engaged or not, tend to be less committed to their relationship with each other and are less likely to marry. Couples marrying after cohabitating have a higher divorce rate than those who do not. To learn more, go to For Your Marriage. 4.) Q. What is the Church’s statement regarding birth control? A. Responsible parenthood calls for couples to be open to life, generous and self-sacrificing. The Church gives guidance to couples by offering Natural Family Planning as a healthy, morally acceptable, alternative to artificial contraceptives as they prayerfully consider their calling to parenthood. To learn more, go to For Your Marriage. 5.) Q. Are there any special requirements for Catholics to raise their children Catholic? 6.) Q. Should we have a Mass or not? A. Church law requires a wedding between two Catholics to be celebrated within a Mass. A wedding between a Catholic and non-Catholic may also be celebrated during Mass; however, sensitivity should be given to an inter-church wedding. The Catholic Church does not offer open Communion; therefore, interdenominational or interfaith couples may choose to give more attention to a scriptural ceremony outside of Mass. To learn more, go to Getting Married Guide. 7.) Q. Are there any restrictions on where we may marry? A. Church law specifies that in marriage between two Catholics the wedding must be celebrated in a Catholic church. Occasionally, in a marriage in which only one party is Catholic, a dispensation may be granted allowing the wedding to take place in the non-Catholic party’s church because of his or her connection to that church. The diocese does not grant permission for weddings to take place in nondenominational chapels, outdoors or in secular settings. To learn more, go to Getting Married Guide. 8.) Q. May a priest officiate at a wedding in another denomination’s church? A. Yes, a priest may officiate in the church of another faith denomination as long as one of the parties is Catholic and both have completed the Church’s requirements regarding marriage preparation. To learn more, go to Getting Married Guide. 9.) Q. Can we write our own vows for the marriage ceremony? A. No, the Church’s ritual specifies the words to be used in the exchange of vows. The basic structure of the marriage rite includes three questions of intention, exchanging of wedding vows and exchanging of wedding rings. Although commonly called “vows,” it is more appropriate to say “declaration and reception of consent.” There are two approved forms of consent that may be used in the rite. Following the consent and blessings and exchanging of rings, it would be appropriate for the couple to recite a personal prayer to one another. To learn more, go to Getting Married Guide. 10.) Q. Can we have readings from sources besides Scripture, such as a poem, letter or favorite story? A. The Church provides a rich resource of Scripture readings, prayers, vows, blessings, and other alternatives that a couple may select from for the wedding ceremony. When the marriage rite is celebrated inside Mass, the flow of the liturgy designates the required readings. When the marriage rite is outside of Mass, the epistle and Gospel should be included. If you have other readings, poems, letters, or stories you would like to use in the ceremony, discuss the matter with the priest. He may be able to include them in his homily or he may approve their use after the Communion prayer (if there is a Mass) and before the final blessing. To learn more, go to Getting Married Guide. 11.) Q. Are there guidelines on the music to be used at our wedding? A. Yes, only sacred music may be used during this solemn and sacred event. Some parishes have specific guidelines. If some of your favorite music is questionable, think about using it at the wedding reception. To learn more, go to Getting Married Guide. 12.) Q. May we place flowers in front of the statue of Mary or light a unity candle during our marriage ceremony? A. Although neither of these are a part of the ritual for weddings, it has become a Catholic tradition to place flowers in front of Mary and some couples want to include the unity candle in their ceremony. A clear understanding of the meaning of adding these traditions to your wedding needs to be reflected upon before you add them to your ceremony. 13.) Q. Should we have a liturgy program for our wedding? A. Some couples find a two-page program beneficial. Also, the program may encourage the guests to participate more fully in your ceremony. A wedding program may list the order of the ceremony (i.e., songs, Scriptures, responses, etc.). 14.) Q. Is videotaping of weddings permitted? A. The wedding is primarily a religious ceremony, an act of worship. Professional photographers and videographers are welcome in most churches, but they have a restricted role and place. They should clearly understand where and when they are allowed to take pictures so that they do not detract from the central focus of the liturgy. 15.) Q. Should we have a budget for our wedding? A. Couples should create a budget for their wedding and stick to it. Working within a budget will prevent going into debt for years to come. Nothing is more frustrating than to be paying for the wedding one to five years down the road. Be realistic. Focus on the essential elements of the wedding ceremony. To learn more, go to Getting Married Guide.